It wasn’t so long ago that the world was in an absolute panic over Ebola. The virus, with its horrific symptoms and staggering mortality rate (as high as 70%), was marching almost unabated through several West African countries, killing thousands. Eventually, cases started popping up in the United States and Europe. Travel restrictions were imposed. Public health warnings were issued. Ebola “czars” were appointed. Breathless Ebola-related reports dominated news media for months. More importantly, though, a global healthcare industry response to the epidemic catalyzed. Governments, corporations, and charitable organizations — including the Bill & Melinda Gates Foundation — poured tens of millions of dollars into aid and Ebola treatment research. Hundreds of doctors, nurses, and other medical professionals traveled to Africa to fight the disease on the front lines. R&D into Ebola drug candidates accelerated. Devices that could potentially help diagnose and treat the disease were fast-tracked by regulators. One company that found itself smack in the middle of the Ebola encounter was Cerus Corporation, maker of a technology that inactivates pathogens in transfused blood components. The company’s Intercept Blood System activates proprietary molecules using ultraviolet light or pH change, depending on the application. These molecules then bind to DNA and RNA in platelets, plasma, or red blood cells, blocking replication of pathogens such as viruses (like Ebola), bacteria, parasites, or harmful white blood cells — thus rendering them inactive. The Intercept system was approved in Europe as a medical device for the treatment of platelets in 2002, and for plasma in 2006. Cerus received FDA approval for Intercept as a combination product (device-biologic) for plasma at platelets in December 2014. More than 100 blood centers in 20 countries have adopted the technology to protect their blood supplies, and Cerus is currently running clinical studies in the U.S. and Europe for red blood cells (with plans to file for a CE Mark in 2016). Cerus is no stranger to infectious disease epidemics. Also in 2014, the company submitted — and later received FDA approval for — an expanded access investigational device exception (IDE) to use Intercept in areas of the U.S. stricken by the Chikungunya and dengue outbreak. (Yes, the same Chikungunya that Lindsey Lohan recently contracted!) And when Ebola reared its ugly head, Intercept was one of the technologies that received financial backing from the Gates Foundation. 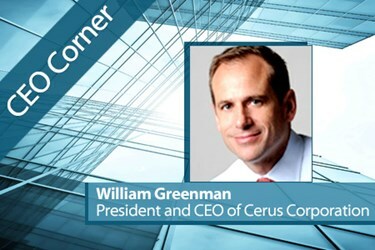 Earlier this month, I had the pleasure of speaking with William “Obi” Greenman, Cerus’ president and CEO, who has been with the company for nearly 20 years. We discussed the Intercept system, the factors behind Cerus’ recent public stock offering, the modular premarket approval (PMA) pathway it used for Intercept, the story behind its Ebola involvement, and why it is uniquely positioned to help stop future infectious disease outbreaks. Med Device Online (MDO): Please tell us about Cerus and what differentiates your technology from alternatives on the market. Obi Greenman: Cerus is a company that's been around for more than two decades, and has a singular mission — to make the Intercept blood system the standard of care in transfusion medicine globally. Intercept is novel in that it is broadly deployable and easy to use. It can be used at blood centers, both large and small, throughout the world. We have deployed the technology in places like Tahiti and Kuwait, but it is also the standard of care in, for example, Switzerland. Testing has been the foundation for blood banking for many years now and obviously has evolved significantly with the advent of nucleic acid testing. This development has led to very definitive improvements in blood safety over the last three decades. However, the one thing that is challenging about testing is that you can only test for those pathogens that you know. So when a new disease comes along, there is a time period required to develop the new assays and make them sufficiently sensitive. And obviously there is a cost involved with adding new assays to address new pathogens. In contrast, Intercept’s pathogen inactivation allows you to target the nucleic acids of pathogens in blood components, regardless of what pathogens have potentially contaminated them. It has a much more comprehensive spectrum of protection than testing does. That gives blood banks confidence that if a new pathogen were to come along, it is likely to be inactivated by the process. MDO: How did Cerus get involved in the Ebola space? Greenman: One thing that was evident with Ebola was the dearth of therapeutic options available to treat patients, as the epidemic expanded significantly over the course of the summer. We got in touch with a group called ClinicalRM, which was looking at using convalescent plasma from survivors of Ebola, which is rich in Ebola antibodies, to transfuse into patients who are still sick with the virus. They were trying to figure out a way to deploy that option to patients in West Africa rapidly, in spite of the lack of infrastructure in that part of the world. They were very serious about doing it and had inroads into the Gates Foundation to try and move it along more quickly. In addition to the issue of collecting plasma in an environment that lacks functioning blood centers or hospitals, another key challenge was ensuring the safety of that blood component in a place where malaria is endemic and HIV and hepatitis incidence is higher than in the West. One of the options was to put Intercept systems on mobile blood centers, essentially on busses. So we collaborated with ClinicalRM on defining a list of components necessary to outfit the blood mobiles. In addition the Intercept system, they needed apheresis equipment to collect the plasma, freezers to store the blood components, an on-board generator, etc. Our engineers worked out the electrical requirements, and then helped assemble the three blood mobiles in North Carolina. The vehicles were then carried by airplane to Liberia, Nigeria, and Guinea. This all happened over the course of three months. It was a testament, first and foremost, to the fact that Intercept technology can be used in remote settings, even the most remote settings you can imagine. It also showed that Cerus is a very nimble company that wants to do the right thing — to move expeditiously to impact people’s lives. MDO: Is Intercept also being used to fight Ebola here in the U.S.? Greenman: Yes. Nine of the 10 patients who have been treated for Ebola in the U.S. have received convalescent plasma from survivors. One of the challenges has been developing a reliable process by which you collect plasma from Ebola survivors and stockpile it for future patients who contract Ebola and are treated in the U.S. There are four biocontainment units in the U.S., one of which is at Emory University Hospital in Atlanta. What have partnered with Emory to establish a process by which donors who have had Ebola can donate their plasma, which is then treated with Intercept, frozen, and stockpiled for future patients who might need the product. Historically, the FDA was actually being forced to treat each of these instances as a one-off emergency-use IDE, because Ebola survivors are not typically considered suitable blood donors. People who donate blood have to fit a certain profile, and if you have traveled to West Africa or other countries that have malaria, you are precluded from donation. This ended up becoming something of a regulatory burden. What Cerus and Emory were able to do was create a centralized way to approach all future convalescent Ebola plasma donation and treatment. If an Ebola patient comes into the National Institutes of Health (NIH) or the biocontainment facility at the Nebraska Medical Center, plasma will be sent from Emory to treat those patients. MDO: Was the Ebola notoriety the main driver behind Cerus’ recent public stock offering? Greenman: Obviously, the Ebola epidemic increased people’s awareness of emerging pathogens, but I would attribute the progress we’ve made over the last six months to other factors. The FDA's growing concern about bacterial contamination of platelets, for instance, was instrumental. The agency issued a guidance document to industry on December 8 that set some very specific recommendations for how to mitigate risk against bacterial contamination of platelet components. That was one key factor. Another was the Chikungunya and dengue epidemic in Puerto Rico — and the concern about it reaching the southern U.S. — which triggered, at least from a regulatory perspective, increased awareness about the benefits that Intercept might afford. Under the testing paradigm, you would have to come up with an assay to identify both dengue and Chikungunya with sufficient specificity and sensitivity, which obviously would take time. Pathogen inactivation, if it were implemented, would essentially address those risks immediately. Finally, the rapid FDA approvals of Intercept for plasma and platelets, which came in within two days of each other in December, really set the stage for our financing earlier this month. MDO: Speaking of FDA approval, why did you choose the modular PMA pathway for Intercept over the traditional PMA? Greenman: Selecting the modular PMA is really a function of what data the manufacturer has available in their dossier. Typically, the last component of a PMA submission that manufacturers have to complete is the clinical data. The modular PMA allows you to submit all the other components in advance of having the clinical data readout and the clinical report. Our situation was a little different. The clinical data on Intercept had been around for some time — we supplemented our Phase 3 clinical data with a lot of data out of Europe, where the device was already approved. [Editor’s note: Intercept is classified as a biologic by the FDA, hence the Phase 3 study.] We chose the modular PMA path because we had some additional work to do on the manufacturing front. The system is manufactured in Europe, and the FDA has very specific requirements around good manufacturing practices (GMP), so that was the last module to go in for us. You could argue that the modular PMA approach does delay things a little bit, because you’re not submitting the whole PMA at once. On the other hand, it does give the FDA the ability to review the various modules in advance, or as part of a continual process, so it can expedite the overall review period. That ultimately proved to be the case with Intercept, as the FDA was able to complete its review within 180 days for both products. The FDA was super-constructive throughout the process. They have a reputation as being very careful and cautious, but what we observed from the process was despite it being a very data-based decision making process, they moved quickly and provided very constructive feedback. We were very happy with the whole engagement with FDA. MDO: What lessons did you learn while bringing Intercept to market? Greenman: Data rules the day. You can only generate a limited amount of clinical data in clinical trials. But the data you can generate in the post-approval side, specifically in Europe, is very powerful in establishing the safety profile of a product, especially a product like this, which ultimately impacts entire national transfusion services. The challenge in the blood banking field is maintaining the safety and availability of a blood supply for whole regions or whole countries. Therefore, blood banks are very cautious in their decision making. New technologies really have to be proven, both clinically but also operationally, before blood centers are likely to adopt them. They are under a lot of pressure to reduce cost and improve efficiencies. If your technology doesn’t afford operational cost savings, and hasn’t been proven in routine use — in other geographies like Europe, for instance, where it can be approved more quickly — it is very challenging to make progress. In hindsight, we could have more effectively leveraged routine use data coming out of Europe, specifically in France and Switzerland, which has a government-mandated haemovigilance program that keep data on every single transfusion episode and outcomes. That doesn’t exist in other parts of the world, including the United States. However, you can take that postmarket data set to other regulators, including the FDA, and national transfusion services to demonstrate the safety of the product in routine use. The order of magnitude between the data set you have from Phase 3 clinical studies and from the post-approval setting is just night and day. MDO: How have you implemented these learnings into Cerus’ operations? Greenman: As a company, we now have expertise in a regulatory pathway that most other companies don’t have, just given the complexity of it. We really had to pioneer a regulatory pathway, not only on the approval of the Intercept system, but also on the treated blood components. It was something that was so sufficiently novel that most regulators hadn’t seen it before. We were the first to do this, and now our organization is geared up to approach obstacles in that fashion. Also, we have made haemovigilance data core to our organization’s capabilities. We have a truly unique blend of clinical affairs, regulatory, and marketing and sales experience. Obviously, the sales and marketing team is out there trying to make sure we run these Phase 4 clinical studies or haemovigilance programs in a way that generates data that supports the sale of the product. This is a long game, and it’s a story of persistence. Cerus was very focused on its mission, and our employees take a degree of pride in what we have accomplished. Every time a new country converts 100 percent to Intercept, our people are very happy about the fact that we are helping blood centers in those countries safeguard their blood supply. MDO: What are the next steps for the company? Greenman: In the immediate term, our focus is on the U.S. launch. Hopefully, that is in platelets, and really understanding what the FDA guidance document means in the context of that launch. In parallel with that, we are continuing to try to expand our business in Europe and other parts of the world. In addition to filing for regulatory approvals in places like Brazil and China, we are looking to deploy the technology in South Africa and other major countries in Europe. Any success there would have a profound impact on our sales growth. Then, the biggest market of all is the treatment of red cells. In December, we announced the outcome of our Phase 3 clinical study in Europe. We will be moving toward filing a CE Mark in the 2016 timeframe. As I mentioned earlier, we are trying to leverage our experience from the platelet and plasma process to generate the data set we need for red cells to ensure that the technology is widely adopted.